Unofficial Copy: Reference to this paper should be made as follows: Owens, T. (2012) ‘Tripadvisor rates Einstein: using the social web to unpack the public meanings of a cultural heritage site’, Int. J. Web Based Communities, Vol. 8, No. 1, pp.40–56. Near the US Capitol, in front of the National Academy of Sciences sits a gigantic bronze statue of Albert Einstein. The monument was created to celebrate Einstein and the sense of awe and wonder his work represents. However, while under construction, art critics and some scientists derided the idea of the memorial. They felt the scale of such a giant memorial did not fit the modesty of Einstein. This paper explores the extent to which perspectives of the monument’s public supporters and critics can be seen in how people interact with it as evidenced in reviews and images of the monument posted online. I analyse how individuals appropriate the monument on social websites, including Fickr, Yelp, Tripadvisor, and Yahoo Travel, as a means to explore how the broader public co-creates the meaning of this particular memorial. I argue this case-study can serve as an example for leveraging the social web as a means to understand cultural heritage sites. Every day, visitors on to the US Capitol explore the National Mall. Some of them stop at the corner of 22nd Street and Constitution Avenue, outside the National Academy of Sciences, some 30 yards from the Vietnam Veterans Memorial, to visit with the bronze statue of Albert Einstein. From the look on the statue’s face, it is obvious that he is deep in thought. As one approaches the monument, several striking features come into view. He is a giant; if the bronze Einstein were to stand upright, he would be over 21 feet tall. From a distance, one can already see that the statue is very different from the equestrian statues that occupy most of the other street corners around the National Mall. Instead of standing erect, he is sprawled across three stone steps. The very texture of the monument, often referred to as the sculptor Robert Berks’ signature ‘chewing gum’ style, makes Einstein appear rough and unfinished. After taking in the immense likeness of Einstein, one notices two other major elements in the memorial. At Einstein’s feet, small metal studs map out a chart of the cosmos from the moment day the memorial was dedicated, April 22nd 1979. In his hands he holds several sheets of paper, inscribed with three of his most famous equations. The Albert Einstein Memorial cost the National Academy of Sciences more than half million dollars in 1978, and it is one of sculptor Robert Berks’ crowning achievements. The monument was created to celebrate Einstein and the sense of awe and wonder his work represents. However, while under construction, the monument was derided by art critics and some scientists who felt the scale of such a giant memorial did not fit the modesty of Einstein. This paper explores the extent to which perspectives of the monument’s supporters and perspectives of the monument’s critics can be seen in how people interact with it. By analysing traces of the monument in travel websites, and the ways individuals have captured and shared images and videos of it on social websites, I use this paper to articulate an approach to analysing how the broader public can co-create meaning with a cultural heritage site. The social web provides those interested in understanding how the public is interacting with monuments an unprecedented resource. While historians have made use of personal reflections on public monuments and memorials to understand how the public is interacting with these sites before, until now, nothing has made it this easy to get a quick sense of how visitors are engaging with these spaces. Websites like Flickr provide hundreds of images of obscure museums, monuments and memorials, and thousands of images of more popular places. Websites like Trip Advisor, Yahoo Travel, and Yelp provide repositories of the elements visitors find to be the most salient in their experiences with monuments, memorials, and museums. These sites provide a powerful means to explore how individuals are ‘using’ these cultural heritage sites. In this case study, I will demonstrate how the images and comments on the social web provide a unique perspective on what theses places mean to visitors. 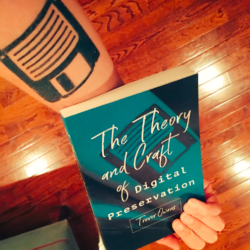 Along with providing a sense of how individuals have interacted with these museums, monuments, and memorials, these social websites are also becoming part of the frame through which other individuals interact with these places. When families across the world plan their visit to DC by consulting sites like Tripadvisor, the comments and reviews from other visitors provide an interpretive frame for their visit. If you want to understand the monument, what the monument means to visitors, it is critical to consider the way in which sites like Tripadvisor are providing a space for individuals to share their views about museums, monuments and memorials and the way in which those shared views are then becoming part of the frame through which other viewers interact with those museums, monuments, and memorials. Over the last 20 years the way in which individuals interact with, and understand museums, monuments, and memorials has become a dominant approach to understanding these places. Examples of this approach can be found in the growing body of research in public history that focuses on the way in which the public uses cultural heritage sites (Falk, 2000; Leinhardt and Knutson, 2004; McClellan, 1999; Hass, 1998; Rosenzweig and Blackmar, 1998). This project complements these approaches by exploring the way in which new media further enables this kind of use-oriented scholarship. The nature of the traces of the monument online is an inherently imperfect record, it is an add hoc corpus of interpretations of the monument. This is at once a deficiency and a strength of this kind of work. Manovich (2002) argues that the database, a core component of new media, is unlike a monograph in that no object is privileged on the first page. While the haphazard nature of this kind of corpus of individual expressions on these sites does not allow for comprehensiveness it does offer a chance to capture a sense of the diverse currents in thought which analysis of particularly successful, or well marketed, interpretations in official press releases or traditional monographs would miss out on. To some extent, this approach embraces the haphazard database structure at the core of the web as a means instead of attempting to treat it as a more traditional medium. This paper is fundamentally about the two different kinds of stories one can tell about this monument. To provide a proper context to the role these websites play in co-constructing the meaning of this particular monument it is crucial to establish the kind of story that develops through the study of the intentions behind the creation of it and the critical reaction the monument received. To this end, I first present the history of the monument that emerges from more traditional source material, archival documents and records from the popular press. With that initial story in place, I then explore how people are engaging with the monument on a range of social websites. By juxtaposing the kinds of stories the traditional sources and the social media sources suggest, I demonstrate the importance of the social web for triangulating the meaning of the memorial. To understand the monument and to triangulate the way different sources tell different stories about it my analysis begins by focusing on the highly visible public movers involved in the creation and criticism of the monument. This includes its sculptor, Robert Berks, the monument’s patron, President of the National Academy of Sciences, Philip Handler, and its chief antagonist, Paul Richard, Art Critic for the Washington Post. This section is simultaneously about the story of the monument and the story of the sources that allow for the creation of that history. This section draws on digitised copies of the Washington Post and documents archived in the National Academy of Sciences archive. These are rich sources for telling this kind of story, but they also provide a powerful point of comparison for thinking about the nature of these traditionally archived objects. Establishing the history of the monument and the intended and interpreted meaning which these prominent individuals derived from the monument will later provide a context for understanding how individuals on the social web are interacting with those ideas. In 1953 Albert Einstein, age 76, posed for sculptor Robert Berks. The Chiam Weizmann Institute of Science in Israel had retained Berks to sculpt a bust of Einstein to commemorate the achievements of the world’s most famous Jewish scientist. When Berks entered Einstein’s home, he had little idea that this session would inspire a much grander work. In the meeting Berks became convinced that a bust would not be enough to do justice to his subject. He decided a full statue would be necessary, and it would take him the next 26 years to make that impulse into a reality. Berks’ retrospective descriptions of how he became convinced that a full statue would be necessary reveal a bit about the ideals embedded in the monument at its conception. To Berks, Einstein appeared saint-like, he told a reporter that the way the sun hit Einstein’s hair looked ‘like a halo’. He went on to note “his head was so large his body seemed to hang from it – like a spiral nebula” (Richard, 1978a). Berks became convinced that a bust of Einstein was not enough. He felt it crucial to build a full statue of Einstein, not because including his body would present a complete Einstein, but because including his body would demonstrate all the more that Einstein was primarily a mind. In Berks’ vision, Einstein was not so much a person as he was an embodiment of a mythic ideal, a way of thinking about Einstein that was, as far as popular culture was concerned, quite a bit ahead of its time. As Berks developed the statue, he worked his views of Einstein into the model. The idea of Einstein as a giant head atop a fragile body already worked to reinforce this vision, but it is all the more evident in the way Berks intended the relationship between the statue of Einstein, the paper he holds, and the star chart at his feet. When asked about the meaning of the monument Berks responded, “You are inside his head. What is inside? The whole universe”. Berks would later make this even more explicit. He suggests “Allegorically, you enter into Einstein’s explorations of the mind, and they encompass the universe” [Lyndon Baines Johnson Library and Museum, (1989), p.36]. Not only does Einstein’s head seem to float, dragging his body behind him, but the entire universe and his equations are all referents to the idea of Einstein as the embodiment, of an abstract notion of genius taking shape as the mythic Einstein. At the moment of its conception the statue of Einstein was already deeply connected to ideas of Einstein taking shape in popular culture, art, and literature. Friedman and Donley (1985) suggest that after the Atomic Bomb the popular story of Einstein became entangled in two myths. They argue that in the ‘40s and ‘50s, Einstein’s image was caught up in the story of the Atomic Bomb. In this story Einstein is a modern Prometheus. In his work for science he “inadvertently created the threat of nuclear holocaust which hangs over mankind” (1989, p.156). In art, literature, and popular culture during the ‘40s, ‘50s, and ‘60s Einstein was generally portrayed as this kind of tragic figure. By the 1970s a different myth of Einstein had emerged. By this time the bomb was no longer a major part in the story, and commemorations of him, particularly surrounding the centennial of his birth in 1979, almost entirely removed connections between him and the atomic bomb. Instead, from this point forward Einstein serves as a proxy for “intelligence in general, and the scientific mind in particular”. By this point, Einstein can be used to market all sorts of products. Everything from hosiery, to beer, to toys has benefited from his iconic image as an endorsement of the product as a ‘smart’ choice. His name is synonymous with genius. He seems to “radiate cosmic humility, generosity, unselfishness” (1989, p.156). It is important to recognise that this focus on Einstein as an abstract mind already removes several elements of his character that could have provided different kinds of memorials. In his life, Einstein was involved in many causes, a Zionist, an outspoken desegregationist, and pacifist (1989, p.180). The seated Einstein, concerned solely with the intellectual issues on the cosmic scale, leaves no room for these other Einstein. The ‘cosmic’ Einstein is the Einstein immortalised outside the National Academy of Sciences. Berks tried to convince the faculty at the Chaim Weizmann Institute in Israel to expand his commission to create a full statue of Einstein instead of the bust he had been retained to create. As a private institute for scientific research in Israel the Weizmann Institute is a natural place to memorialise the most famous Jewish scientist. As a supporter of the Zionist movement, Einstein was already a source of pride for Israel. Indeed he was even offered the first Israeli presidency. Berks was, however, unsuccessful at convincing the Weizmann Institute that they needed anything beyond the bust he had been commissioned to create. After the Weizmann Institute passed on the statue, Berks tried to place the monument in Princeton, New Jersey. Einstein had lived and worked in Princeton for 23 years. On the Princeton campus a monument to Einstein would have connected directly with both the history of the institution and the city, pointing to a legacy in scientific thought. It was a tough sell, however. During his lifetime Einstein had made it clear to his associates at Princeton that he did not want his home or his office turned into museums. Even today, his home remains a home for one of the universities researchers. Because of Einstein’s reluctance to be memorialised in his home and office, the community felt that he would equally have been dismissive of a monument in his honour. Ultimately, the statue would not find a home where Einstein had lived and worked. In 1960 Berks was closer than ever to placing his monument. Sen. Jacob K. Javits, a Republican from New York, proposed that the statue be built somewhere on the Smithsonian grounds. The idea was so close to becoming a reality that pictures of a model of the monument appeared in the The Washington Post. As the first of the potential sites to place the statue on the National Mall, it is also the first location to make the story of Einstein a national American story. In the end, Javits proposal failed. The statue would not have a home on the Smithsonian’s grounds. After coming so close to placing the statue on the Smithsonian’s grounds the memorial would have to wait another 17 years to find its final home. As 1979 – the 100th anniversary of Einstein’s birth – approached, a resurgence in interest translated into another opportunity for the memorial. All manner of institutions were shopping for ways to remember and honour the scientist. As Philip Handler, the president of the National Academy of Sciences, looked for a way to commemorate the occasion, he came across Berks’ statue and rapidly approved it, giving Berks’ less then a year to complete the memorial before the centennial. The monument, however, still had many hurdles to clear before it could be constructed. From the very beginning Philip Handler’s proposal for the Einstein memorial faced stiff criticism and resistance from friends, coworkers, and other power brokers on the national mall. As early as March of 1978, William T. Golden, former science advisor to president Truman and Handler’s personal friend, had warned Handler for “reasons spiritual, intellectual, and aesthetic” that the 2.5 million dollar price Berks had requested suffered ‘from a misplaced decimal point’. Golden (1978) proposed that the National Academy hold a competition to get a more reasonably priced monument for Einstein. While Golden had offered compelling reasons to think about scraping Berks’ statue Handler was unmoved. Berks’ statue went ahead as planned. Handler was successful in talking down the price of the monument to 1.5 million dollars, however that was not enough to make David Schaff, arts consultant to the academy, comfortable. Citing difficulties in constructing a base to support the full statue; difficulty raising funds to pay for the full statue; and “irregularities in the fees, contracting and negotiations as carried out by Mr. Berks”, Schaff suggested the Academy take the smaller 10 foot model Berks had created as an interim step in the construction of the statue as the final product. Beyond saving the Academy a small fortune, Schaff believed that the smaller statue, “would be considerably less depersonalised than the 21 foot figure” (Golden, 1978). Still as these issues arose Handler remained committed to the full statue. The following month Schaff brought more bad news. Handler had hoped that the substantial costs of the monument could be offset through grants from the National Endowment for the Arts or US General Services Administration. However, through private communication with an associate at the National Endowment for the Humanities, Schaff had been informed that even simply applying for the funding could subject the project to ‘broad criticism’. The primary issue, Berks’ fee was “seven times greater than any received by an artist involved in a project” which either institution had previously funded (Schaff, 1978). Still the hurdle for funding did not stop Handler from moving ahead with the Einstein monument. Just as the myth of the cosmic Einstein was present in Berks’ vision for the monument, it was also present in Handler’s decision to finance, and his persistence to place the monument on the National Academy of Sciences grounds. “At first, the thought of its imposing size gave me pause; I worried that it might be excessive” he wrote to the members and employees of the academy. “For who’s gratification… is it being built I wondered. The answer was simple… It will be the multitudes of visitors who travel along Constitution Avenue… Up close, the seated Einstein figure will seem very, very large indeed, the physical representation of the fact that he was a giant among men” (Handler, 1978). For him the scale of the statue was central. It was crucial that the statue’s size humble passers by to the giant Einstein. Handler wanted the mythic Einstein perpetuated by Berks’ statue because it connected with a notion of absolutely pure science. Handler told Berks that Einstein represented the “synthesis of the analytic mind at the heart of science”. Further, that “Einstein stood for the best of what humanity is intended to mean” and “a real token of what science is to our civilisation” (Handler, 1978). Handler’s support for the monument was intimately tied to his belief in the cosmic Einstein that the monument had been intended to portray. As their vision slowly came together in 1978, a new controversy was waiting to unfold. As the construction on the monument began criticism of the project mounted. Foremost of the complaints against the project were its unprecedented cost and the notion that it failed to properly memorialise Einstein. Handler received half a dozen letters from scientists asking him to cancel the project. George Wallerstein, Chairman of the University of Washington’s Astronomy Department and Trustee at Brown, complained to Handler that the statue was decadent and that the money spent on it would have made a much more fitting tribute if it were spent to endow post-doctoral fellowships to continue and extend Einstein’s work. A physicist at Rutgers wrote to tell him that instead of offering money to support the project he would offer “$100.00 to defray whatever expenses are involved in stopping the project”. In this, and many other letters people petitioned the National Academy to abandon the project because it failed to follow Einstein’s wishes. The fact that Einstein did not want his home and office made into memorials had become widely known. When critics weighed in they often insisted that the proposed memorial did not fit the modesty of Einstein. Richard offers several arguments for this position. First, that the wide availability and use of cameras had removed the need to show people what someone looked like through statues. Second, and more convincingly, that ‘the ‘heroic scale’ no longer seems heroic. That “the scale of the skyscraper has dwarfed most metal statues. Liberty appears more imposing from the sea than she does from an airplane”. Richard insists that the scale of contemporary life, the heights experienced in air travel and the towering height of skyscrapers meant that “The Einstein by the Mall, though more than three times life-size will seem a giant doll”. Richard claimed that the existing statues “of warriors on their horses and sages on their thrones” in Washington mock attempts to build statues of modern figures. He insisted that monuments like the statue of Einstein were the “death twitch of an old tradition. Huge public portraits made of bronze no longer seem to work”. [Richard, (1978b), p.L1]. After an article in the Pittsburgh press reiterated this sentiment Handler felt the need to respond. While the wishes of the subject of any memorial may seem like relevant information to consider in memorialising them Handler dismissed it as ‘preposterous’. He asked if we should rather ‘erect monuments to those who so request?’ Further proving his point Handler asked if one could “imagine Abe Lincoln proposing the temple in which we now venerate him?” While many continued to argue against the idea of a monument to a man who was not particularly interested in being memorialised a sizeable contingent of scientists felt the need to write in to Handler to offer their support for the project. In a show of support the American Society for the Advancement of Science and the American Physical Society offered up their mailing lists for the National Academy of Sciences to solicit funds directly from their members. Through those solicitations, along with direct solicitations of private corporations, the Academy was able to secure roughly half of the final 1.6 million dollar price tag. While there was substantial criticism of the project it also had a strong contingent of supporters both inside and outside the scientific community. Beyond the general criticism of memorialising Einstein and the cost of the project attacks from Paul Richard, art critic for The Washington Post were particularly savage. In a series of columns in The Washington Post, he made it his personal mission to discredit the idea of the monument and with it the entire notion of modern portrait sculpture in general. Richard’s protests against the statue were so persistent and so damning that they were instrumental in scaring away many potential donors. His disdain for the monument eventually required the National Academy of Sciences to spend three quarters of a million dollars of its endowment to pay off the loan it took out to pay for the construction of the monument. Richard informed the readers of the Post that the statue was “a gigantic, ill-advised chunk of public piety” which “promises to be gross as well as trite”. In one article entitled ‘End of the bronze age’ Richard rhetorically asked “Can Traditional Outdoor Sculpture Adapt to Modern Times?” The rest of the article explained why there is no longer a place for portrait sculpture in the nation’s capitol. Beyond these initial critiques Richard went on to argue that the monument of Einstein does not hold the depth that monuments of other eras hold. He declared, “The public statues of the past were not merely portraits, but complex coded messages of political spiritual and economic power”. That great statues both ‘idealised their subjects’ and that the “most impressive statues are superhuman images that somehow strike the viewer as real as can be”. In this case, Handler is simply mistaken. If these criteria are indeed the criteria one should judge great sculpture by the statue of Einstein is an exemplar. While Einstein is not presented with the idealised body found in ancient Greek statues, the monument does idealise his body to present coded messages about American science. In this idealisation Einstein’s head becomes the focal point. As already discussed, Berks’ views of Einstein as an abstract mythic mind, a muse of scientific thought, are embedded in the presentation of the statue. On April 22nd 1979 Robert Berks placed the statue. A few articles commented on the monument and the controversy over the next few months. After that the general discussion of the monument in the Art’s section of The Washington Post concluded. But that is really just the beginning of the life of the monument. After the controversy surrounding the initial construction and dedication of the monument had blown over it would be almost ten years before the Washington Post made any mention of the statue. When the statue was in the paper again it was noted as a place for children. In 1988, Mary Ellen Konig, who writes about weekend get-aways and excursions for DC metropolitan parents, presented a very different kind of argument about the value of the statue. At the start of the article Konig’s children beg, “Can we go see Albert? Could we just stop for one minute to sit on Albert’s lap? We want to play with Albert!” Konig explains. “Nooo… my children aren’t begging for the lap of a favorite uncle or the company of a special playmate. They yearn for Albert – As in Einstein – the big fellow who lives on the grounds of the National Academy of Sciences” (Koenig, 1988). Ten years after its construction the statue was a place where children can climb and pose for photos. This individual article offers some small insight into how the monument is being used, but discussions of the memorial on online travel sites offer a much richer space to explore the ways in which the monument is being used. The story so far is the story of those individuals typical in archives. The social web provides another vantage point to develop a different kind of narrative. In juxtaposition to the story of creation and critique the next story is a story of use, of what the monument means to ‘everyday’ individuals. In this section I use a corpus of reviews on public websites as a means to articulate the kind of meaning individuals are making with the monument. To conduct this analysis I created an ad hoc corpus of reviews of the memorial from six popular travel and review sites, including Tripadvisor, Yelp, Yahoo Travel, My Travel Guide. This created a corpus of 21 reviews. After reading the texts repeatedly I articulated emergent themes and used those to code the information to develop a sense of systematic similarities and differences among the reviews. The themes can be understood as part of three general categories. First, reviewers relish in the relative obscurity of the monument, enjoying it as a hidden treasure. Second, reviewers are excited to discuss the informality of the monument, how it invites visitors to climb and have their photo taken on his lap. Third, the informality of the monument creates a tension within the reviews. One reviewer worries if this memorial should be a playground for children? Throughout this section I include images from the photo-sharing site Flickr that both exemplify and complicate the emergent themes. It is important to remember that the emergent themes in these reviews represent a small fraction of the ways people have interacted. Further, the visitors who post comments and share photos are in no way a representative of visitors of the monument. These are the visitors who thought the rest of the world would benefit from their opinion. With those caveats in place, I can now provide analysis of the ways in which the social web documents and frames the Albert Einstein Memorial. Nearly half of the reviews of the Einstein memorial discuss its relative obscurity as an important feature of experiencing the memorial. Reviewers report it as the “best monument in DC that nobody knows about” or, “One of the best kept secrets in D.C”. Another reviewer stated “a lot of people just don’t seem to know it’s there”. For context, the Albert Einstein Memorial sits just alongside the US National Mall, it is directly across the street from the Vietnam Veterans Memorial, and the Lincoln Memorial. In juxtaposition with these large-scale, highly trafficked spaces the Albert Einstein Memorial offers both locals and tourists a space to experience something on a more personal scale. Effectively, the obscurity of the monument personalises the collective and mass experience of the national mall. Other statements about the importance of the monument’s obscurity offer insight into the value this obscurity provides to visitors. For one it is a “little known treasure hiding in plain sight at a very busy corner. It’s a little bit of serenity in the madness of the city”. Another reviewer explicitly connects the experience of the Memorial to the nearby memorials on the national mall. This reviewer suggests, “after leaving the hot, humid, cramped mall we ventured over to see Albert and he was all alone. It was a nice, quite reprieve”. The memorial provides serenity, it provides a reprieve from the city and the mall. Also note that the personalised experience has translated into referring to Einstein by his first name, a theme I will return to. The obscurity of the monument is a central frame for how these reviewers discuss it. It is a kind of semi-public secret. As another reviewer notes, this secret may be under threat. “I use to go here to read, only 4 or 5 blocks from my house. It has become more popular recently, something I’m not to happy about”. As more individuals visit the monument it diminishes the sense of serenity and obscurity that the space provides. For these reviewers, one of the most salient features of the monument is the fact that it is not widely known. Most monuments in the area establish a kind of formality between visitors and the monument. Many are constructed to physically remove the subject from the reach of visitors. Others, like the nearby Lincoln Memorial establish this formality through written rules about respectful behaviour, and a request for hushed voices. Nearly all of the reviews (17 of 21) focus on elements of the informality of the monument as a key component of what makes it enjoyable. The reviewers tell us to “climb all over ‘Al’” or as another suggests “sit on his lap, or kiss his cheek”. On Flickr, photographers have captured this in images of visitors picking and rubbing his nose, kissing him, or in a few cases arguing with him (Photograph available at Flickr1) While there is no posted notices which suggest that it is ok to climb him, if you stop by the monument on any summer day you will witness a queue of visitors waiting to climb up on him and have their picture taken. The pictures are themselves an important element in this experience. Photograph 1 provides an example of one of the most popular kinds of images of the memorial posted on Flickr. As one reviewer notes, “everyone needs at least one picture of themselves sitting on “Al’s” lap”. As you can see from the photograph, the scale and size of the monument makes it work as a space for staging photos. The monument is so photogenic that one reviewer suggests that it “just begs you to go sit on Uncle Al’s lap and get our picture taken”. For these reviewers a central part of the experience is the informality that the monument provides. It invites them to climb him, and leave with photographic evidence of them sitting on the world’s most instantly recognisable scientist. While everyone has photos of themselves standing in front of the Lincoln Memorial these reviewers believe “Your tour of the Mall is not complete” without having your picture taken on Einstein’s lap. It is worth taking moment to reflect on how some of the previous quotes refer to Einstein. The informality of these experiences is further communicated through a persistent use of his first name, or in some cases the diminutive form of his name, Al. This is itself a frequent component of these reviews. In using his first name, or calling him ‘Al’ the reviewers are communicating and playing with the informality of the memorial. The pervasiveness of this informality may be best evidenced in the recollections of a college student from a nearby university who ‘spent a lot of time just hanging out with ‘Al’’. The informality of the space and the fact that it is climbable leads many reviewers to discuss how it is a perfect place to bring kids. Many of the photos of the monument on Flickr show young children climbing all over him. This level of informality is not something that all the reviewers think is necessarily a good thing. One reviewer suggests “most of the neat stuff was totally ignored by all the kids using the statue as a playground”. This reviewer goes on to suggest that the other elements in the composition of the statue, the quotations, and the map of the stars at his feet go unnoticed. From his perspective, visitors were “just jumping around”. He felt that “no one learned or read about the man memorialised”. This reviewer further suggests that it is ‘disrespectful’ to climb all over the monument, particularly, when there is no clear indication that touching or climbing the memorial is officially sanctioned by the sculptor or the National Academy of Sciences. There is defiantly credence to the questions the reviewer raises. To what extent are these visitors leaving with an understanding of the intentions behind the memorial? Certainly some visitor’s suggestions that “You can climb on the damn thing and stick pennies up his nose” take on a disrespectful tone. However, that is itself an interesting point of tension in the idea of Einstein. The more recently constructed Franklin Delano Roosevelt Memorial, which is built on a scale that would allow one to climb on him, does not invite the same kind of interaction. Popular notions of Einstein as an informal figure have translated into how people interact with the memorial. The relaxed experience Berks found in sculpting the memorial from life is very directly translated into visitor’s comments about the informality and relaxing nature of the experience of the monument. While there is some value to the notion that the way some individuals interact with the monument is disrespectful, it is also quite clear from the reviews and images on Flickr that visitors also engage with some of the deeper meaning embedded in the monument. Photograph Truth and Duty at the Albert Einstein Memorial (Photograph available at Flickr2) is a powerful example of how the intended meaning behind the monument can be appropriated and transmitted through another medium. In this case the photographer honed in on an Einstein quote engraved on the base of the memorial. The full quotation reads, “The right to search for truth implies also a duty; one must not conceal any part of what one has recognised to be true”. Instead of presenting the full quote, the photographer zeroed in on two of the words to create a powerful image. The themes that emerged in reviewer’s comments about the memorial can be further explored in two particularly novel photographs. 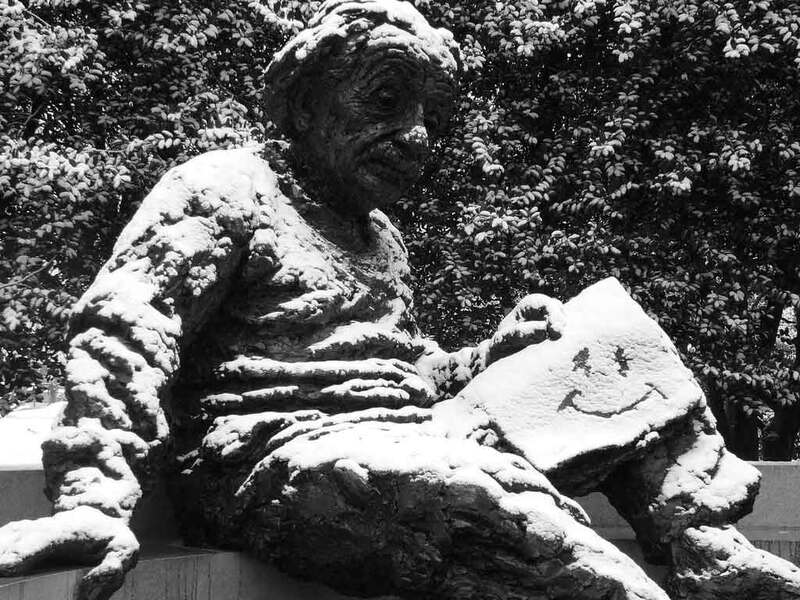 In Happiness is Relative photographer William Kamovitch captured an image of the Einstein Memorial, in winter, with a smiley face marked in the snow on the monument. He notes that “Someone else drew it, I just captured it”. In combination with whoever made the smiley face, Kamovitch has created a striking image. By putting the smiley face in place of Einstein’s most famous equations the image makes the playfully pun, that happiness is relative. The image connects with the informality of the monument, but it does so through creating a distinct approach. Shooting the image in black and white adds to the starkness of the image and draws attention to the face. In a different approach photographer Scott Speck’s My Hand Resting on Albert’s Huge Bronze Right Hand at the Einstein Memorial (Photograph available at Flickr) engages with some of the original intentions behind the creation of the monument. It draws attention to the scale of the memorial, but extends it to the kind of personal connection that comes from reaching out to hold his hand. He is a cultural giant, but you can still reach out and touch him. In both of these cases the photographers have taken the memorial, connected with the meaning Handler and Berks embedded in it, and through their own creative works have presented and engaged with the messages their creators intended to evoke. What is particularly powerful about these two images is the way in which each presents its own artistic statement, but both still retain central characteristics of the argument Berks makes with the memorial. The image of the smile on Einstein’s papers communicates the playful kind of informality we associate with Einstein, and the kind of relaxed idea of him which Berks wanted to capture. The interplay between the intimacy of holding Einstein’s hand and the largeness of that hand in the second photo captures and communicates the same interplay experienced through climbing on the giant statue. He is the approachable giant. In messages about the memorial online reviewers discuss the obscurity and informality of their experience with the memorial. Photos shared on Flickr attest to those elements, and express novel approaches to interpreting the memorial. Together these materials provide considerable documentation to explore the dual purpose of this paper. First, they provide a powerful means to assess whether the opinions of the monument’s creators, or its critics, were more in touch with the way the memorial has come to be used. Second, if one finds this method and approach to provide valuable information, one should consider the potential value that this kind of approach could serve for other cultural heritage sites, as well as the need to archive these kinds of materials for future historians. 4.1 What does the memorial do? The flurry of controversy surrounding the creation of the monument is nowhere to be found in visitors’ reports of their experiences with the memorial. While Paul Richard, the art critic for the Washington Post, insisted that the memorial was unseemly and immodest, there is no mention of this complaint among any of the visitors. Furthermore, complaints from the art community and scientists about the cost of the memorial, and the immodesty of the monument are nowhere to be found. Now, it is important to note that this absence of evidence of these complaints in reviews is not evidence of absence of these complaints in other visitors’ experiences with the memorial. One could argue that the people that come to comment and review the memorial online are inherently people that enjoyed the argument of the memorial. This is however inconsistent with common behaviour on these kinds of social websites. In particular, many reviewers on Yelp relish in posting scathing critiques of places they visit. The reviewers offer evidence that the critics of the memorial were wrong about how it would be interpreted. However, this does not mean that the monument’s creator and patron necessarily had a better handle on what the monument would mean. Berks’ original conception of the seated Einstein, holding his equations with the universe at his feet, as a representation of science as an abstract mental pursuit, is not reflected in the reviews. In fact, very few of the reviews even acknowledge the platform, the quotes inscribed on the memorial or the equations in his hand. This is again not evidence that no visitors to the monument are engaging with this intention; it is simply evidence that it is not one of the salient features of how these reviewers understand it. So, does this suggest that the proponents and critics of the memorial were both equally mistaken about what it would mean to visitors? I think the answer is no. While the most important features of the monument are not the features Berks had discussed, the way reviewers discuss the obscurity and informality of the monument does speak to a connection between Berks’ motives and the way in which the monument is being engaged with and used. 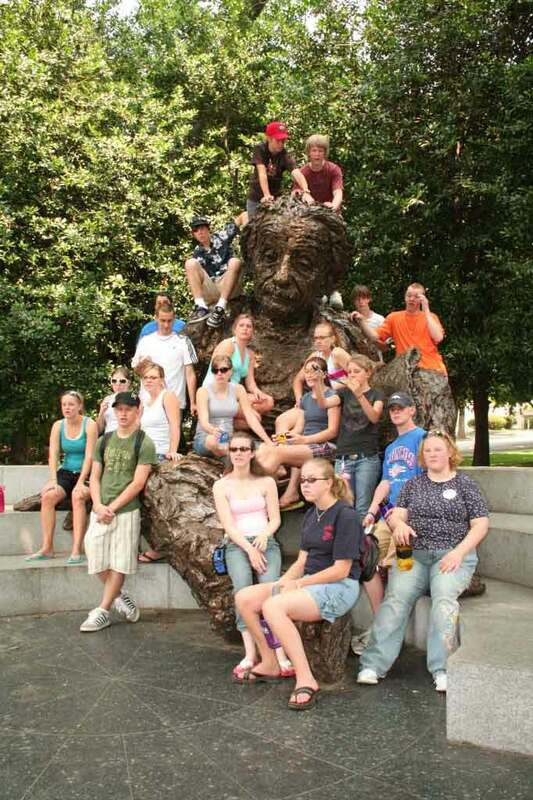 The way reviewers relish in the obscurity of the monument communicates the relaxed interaction Berks experienced with Einstein. It demonstrates how this intention behind the monument is realised in the experience of the monument. As reviewers sit with the statue, share secrets, and enjoy the relaxing experience, they are basking in the reflected experience Berks reported in his own meeting with Einstein. Similarly, the informality the visitors perform when they climb on, kiss, and pose to ‘argue’ with Einstein, all build on top of the kind of obscurity of the monument to further communicate a sense of intimacy with this figure. Richard believed that the scale of the monument made him into a kind of titan, something distant from the experience of individuals, and antithetical to the kinds of modesty Einstein was associated with. However, the pose of the statue, and the way the idea of Einstein invites a sense of informality has translated into the stature of the statue further reinforcing the idea of Einstein as a relaxed everyman. As people pose for photos with Einstein they embed these messages in pixels and on film, and when they share those photos and reviews of the experience online, they become part of the frame through which others experience the memorial. Some of the most important material for understanding how individuals interact with the meaning behind the memorial shine through in the novel ways in which photographers on Flickr have used the memorial to make their own statements. What is particularly powerful about Happiness is Relative and Holding Hands is the way in each presents its own artistic statement but, retains central characteristics of the argument Berks marked with the Memorial. The memorial is successful. It is vital. It is unclear if this is exactly what Berks and Handler expected, but it is clear that the memorial is doing powerful work which connects people to the ideas Berks experienced when Einstein posed for him in the 1950s. The project at hand has underscored the how the social web can provide a rich set of materials to triangulate the ways in which publics make sense of and use cultural heritage sites. While one could interview site visitors in an attempt to acquire similar information such interactions generate substantial reactivity. The participants in any interview are by necessity engaged in an artificial experience and their reactions to the monument are inherently clouded being asked to discuss their views. One might suggest that observation of a cultural heritage site, achieved through lurking around the monument or site might provide better information. The ability to observe how people interact with a site is powerful, but crucially it does not provide access to what is happening inside the minds of visitors to a site. This is not to suggest that either of these methods are not powerful means for understanding how visitors to a site engage with it. It is instead to assert that the statements and visions of these cultural heritage locations freely created and shared on the social web provide a unique vantage point to triangulate how individuals are interacting with these sites. Others interested in using this approach with more popular cultural heritage sites will need to deal with a different kind of problem. The obscurity of this site is not only important for understanding how people engage with it, it was also an important pre-requisite for the potential of an exhaustive review of the memorial online. The value of this new means for triangulating understanding of cultural heritage sites opens a new set of issues for historical analysis. There are 549 images associated with the Albert Einstein Memorial on Flickr. In comparison there are more than 74,000 images associated with the Lincoln Memorial. If one hoped to conduct the kind of analysis I engaged in for this project, reviewing all images and all reviews associated with a place like the Lincoln Memorial it would take an unbelievable quantity of time and effort. Researchers interested in this kind of project can rely on the kinds of sampling techniques that historians and social scientists have employed with other kinds of sources. However, the fact that these resources are ‘born digital’ allows for exciting new prospects for analysing these kinds of materials. Data and image mining tools are still coming into their own, but these kinds of sources lend themselves as a space for cultural heritage researchers to begin to engage with the problems associated with the abundance of these kinds of digital materials. With the potential for mining these born digital resources noted, it is also crucial to acknowledge the problems that emerge from the ephemerality of this digital material. If one accepts the secondary argument of this paper, that the reviews and images of this memorial found online provide an important vantage point into understanding it, then one should be moved to action by the fact that the kinds of traces this paper draws on fade out of existence on a daily basis. 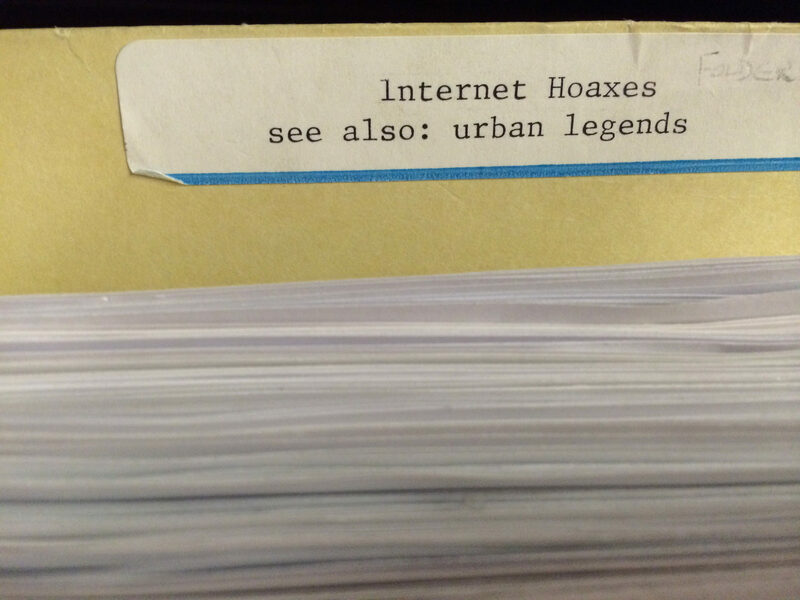 The Library of Congress has recently acquired the full public archive of twitter messages. However, there is no deep archive of all the images on Flickr. The internet archive is doing admirable work attempting to archive the web, but if we see a long-term value in preserving these kinds of ephemera we need to think much more systematically about what that preservation will mean. Published books are deposited with the US Library of Congress. I would propose, that we need a similar kind of requirement, mandate, and funding, to push such organisations to harvest and archive the web. While sites like Flickr, Facebook, Youtube, and Twitter each have a right to provide their users with privacy, the value the contents of these sites offer historians of the future compels us to require that these materials be deposited, if even in a dark archive. The intentions behind the Albert Einstein Memorial are clearly part of the experience of the monument. Analysis of discourse about the monument on Fickr, Yelp, Tripadvisor, and Yahoo Travel, show the interesting and novel ways in which individual visitors are engaging with and understanding the Memorial. When visitors share their experiences with places like this Memorial online they offer invaluable information to researchers who want to understand those places. Further, as many potential future visitors use sites like Yelp and Tripadvisor as to plan trips, the comments on these websites have become part of the frame through which future visitors view their experiences. If we want to be able to explore the ways these sites engage with the meaning of cultural heritage sites we need to think seriously about how we are going to preserve them. Falk, J.H. (2000) Learning from Museums: Visitor Experiences and the Making of Meaning: Visitor Experiences and the Making of Meaning, AltaMira Press. Friedman, A.J. and Donley, C.C. (1985) Einstein as Myth and Muse, Cambridge University Press, Cambridge. Golden, W. (1978) Letter to Philip Handler, March 28th, National Academy of Sciences Archives, Central Policy Files, Einstein Memorial 1978. Handler, P. (1978) Letter to Membership of the National Academy of Sciences, November 13th, National Academy of Sciences Archives, Central Policy Files, Einstein Memorial 1978. Hass, K.A. (1998) Carried to the Wall: American Memory and the Vietnam Veterans Memorial,University of California Press, Berkeley. Kamovitch, W. (2007) Happiness is Relative, available at http://www.flickr.com/photos/bellumdeus/2092773520/. Koenig, M.E. (1988) Scram, Pigeons! Kids are Here, The Washington Post, WE51, 23 September. Leinhardt, G. and Knutson, K. (2004) Listening in on Museum Conversations, AltaMira Press. Lyndon Baines Johnson Library and Museum (1989) Biographies in Bronze: Portrait Sculpture by Robert Berks, An Exhibition, The Lyndon Baines Johnson Library and Museum, April 28–November 26. Manovich, L. (2002) The Language of New Media, MIT Press, Cambridge, Mass. McClellan, A. (1999) Inventing the Louvre: Art, Politics, and the Origins of the Modern Museum in Eighteenth-Century Paris, University of California Press, Berkeley, Calif.
Richard, P. (1978a) Giant among Statues On the Mall, The Washington Post, p.B1, 14 November. Richard, P. (1978b) End of the Bronze Age, The Washington Post, p.L1, 19 November. Rosenzweig, R. and Blackmar, E. (1998) The Park and the People: A History of Central Park, Cornell University Press. Schaff, D. (1978) Letter to Philip Handler, National Academy of Sciences Archives, Central Policy Files, Einstein Memorial 1978, 28 July. Schmidt, C. (2008) Arguing with Einstein, available at http://www.flickr.com/photos/chrisbrenschmidt/2190660089/. Speck, S. (2007) My Hand Resting on Albert’s Huge Bronze Right Hand at the Einstein Memorial, DC, available at http://www.flickr.com/photos/41427422@N00/451604359/. Wing, R. (2006) DCLA-Day-5_049, available at http://www.flickr.com/photos/rwing/206201533/. This paper was originally drafted in the Fall of 2008 for a course on Museums, Monuments and Memory at George Mason University. It was subsequently revised and expanded and accepted for publication in 2010 and ultimately published in 2012. Wow. That is a long process.